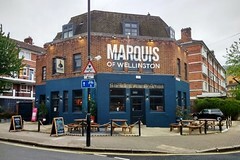 The Marquis of Wellington was a large sports pub on Druid Street in Bermondsey. According to the LondonSE1 forums, as of January 2015 it is closed and boarded up. It reopened under the same name in November 2016, but thoroughly refurbished inside and out, under the "Bermondsey Pub Co" brand of Enterprise Inns. Food is served 11am-10pm every day. The information below significantly pre-dates the refurbishment and reopening. secretlondon went here one weekday lunchtime in September 2008, as they were advertising food outside. They had a menu up advertising food from 7am to 9pm. However there was no food this week due to staff issues. They were selling sandwiches (including toasted sandwiches) instead. I had a toasted cheese and onion sandwich, a packet of crisps and half a pint of coke for £3.90 (photo). The sandwich itself was £1.80. There were at least two bars. I was in a small one with a blue pool table (photo), a television (turned off) and a signed Millwall football strip on the wall (photo). A sign outside mentioned a dart board but I didn't go into the other bar/s to look. Through the bar area I could see a TV showing football in another bar. The ladies toilet accessible from the bar I was in didn't have a working lock. There are tables outside. I don't think it had any hand pumps. secretlondon visited again in October 2008 and they weren't doing any food as the cook was off sick. Accessibility: One step to get in. No extra steps to the toilet I investigated. Last visited by secretlondon, October 2008. Opening hours and food times taken from the website, June 2017. Last edited 2017-06-13 07:28:13 (version 13; diff). List all versions. Page last edited 2017-06-13 07:28:13 (version 13).